Despite nearly fifty percent of Americans resolving to lose weight, only eight percent of resolutions actually succeed. It's a hard pill to swallow, especially because weight loss is such a sensitive and personal goal—knowing that so many fail can be disheartening, to say the least. As a registered dietitian, the primary reason I see weight-loss resolutions fail is simply because they’re not sustainable for the long-term. Weight-focused resolutions often emphasize food restriction and quick-fix diets to achieve short-term weight loss. Weight cycling up and down can lead to a higher weight over time, not to mention a preoccupation with body image and food. For many, the cycle damages their self-esteem and self-worth. So why not break the cycle? Instead of focusing on your weight as motivation this year, replace your weight-loss resolution with one that focuses on lifestyle factors that can promote your success. When you focus on productive lifestyle changes that help you feel better, you’re more likely to stick with it, day after day, and join that eight percent of New Year’s resolution success stories. With these three lifestyle-focused resolutions, you'll feel better overall, boost your energy levels and even lose weight as a side effect of overall healthy living. What are you waiting for? When you’ve focused on weight-loss resolutions in the past, your time in the gym was likely spent burning as many calories as possible, in the shortest amount of time. For most, this meant logging hours on the treadmill or elliptical machines. After all, cardio burns more calories during active exercise compared to strength training. But cardio alone is not the answer to sustained weight loss or management, and, if you loathe spinning or running, you'll find yourself dreading every workout and, eventually, giving up altogether. Instead of doing what you think you're supposed to do, focus on adding variety to your workout regimen and consider how different exercises make you feel. By adding strength or resistance training such as Pilates, yoga or weight lifting, you won’t get bored in the gym. If you've never exercised before, it's important to do some trial-and-error before you land on your routine. Not everyone is going to love a boot-camp class, so it's important to check out different classes, new workout moves, different pieces of equipment and more to see what works for your personality and your comfort level. There is an exercise out there for you—sometimes you just have to seek it out. Strength training also allows you to burn more calories throughout the day—even after your last rep—by increasing your muscle mass. Muscle is more metabolically active than fat, which means the more muscle you have, the more you will increase your resting metabolism. When combined with cardiovascular exercise, like running, biking, dancing or spinning, you can also reduce your fat mass. Even more, consistency is key when adopting a new exercise habit. Choose activities you love (or at least like) and you'll be able to stick with it for more than just a few weeks. You know excessive stress is harmful to your health and well-being, but did you know that stress reduction may be the missing factor in your weight-loss equation, too? Your stress response system is controlled by several hormones, originally designed to act in response to short-term stressors. Adrenaline activates your "fight or flight" response to boost your energy, increase your heart rate and blood pressure, and suppress appetite, among other psychological changes. Then, another stress hormone, cortisol, kicks in. Cortisol releases sugar into your blood for energy, increasing appetite and contributing to an increase in fat stores over time. These quick-acting responses were great at the time when humans were hunters and gatherers, and needed to survive being chased by a bear. When a perceived threat disappeared, stress hormone levels fell back to baseline. However, this is not what happens in today’s high-stress environments. During stressful situations, your body wants to make sure you have enough glucose (sugar) to max out your mental and physical capacity when faced with a threat. As a result, cravings for sugary and fatty foods skyrocket. Consistently elevated cortisol levels are associated with weight gain, reduced energy levels, sleep disruptions, and even high blood pressure and an increased risk of diabetes. As you can see, this does more harm than help, making it more difficult for you to lose weight. Researchers studied why this is the case of measuring the metabolism and insulin levels after feeding female participants a high-fat meal. The most stressed individuals had higher insulin levels and slower metabolisms, burning more than 100 fewer calories per day. This can lead to increases in body fat of up to 11 pounds per year. Whether you're stressed by work, paying bills, your children, your weight or something else altogether, skip reaching for comfort food when stress creeps into your life. This year, try to find a new go-to coping mechanism, such as calling a friend, going for a walk, watching a few funny YouTube videos or cooking a healthy meal, instead. Further make stress reduction a priority by practicing meditation or taking up yoga to combat feelings of helplessness or anxiety brought on by stress. Your mind and body will thank you. A consistent lack of zzz’s doesn’t just make it easier to sleep through your early morning workout class, it makes it much more difficult for the scale to budge. Getting less than the recommended seven to nine hours of sleep can disrupt the hormones that control your appetite. A lack of sleep is associated with lower leptin and higher ghrelin levels, which leads to increased appetite and reduced feelings of fullness. Plus, you'll crave more carbohydrate- and fat-heavy foods and have even less willpower to resist. Furthermore, stress and poor sleep often go together, impacting your stress hormone, cortisol, which, as previously mentioned, slows your metabolism. Compound that with overwhelming feelings of fatigue, and it’s easy for healthy eating habits to slip away. If adequate sleep is a key barrier to your weight-loss success, it’s essential for you to prioritize good sleep hygiene this year. Develop a relaxing bedtime routine that works for you. This could include a soothing yoga routine, using a facial scrub with lavender to calm down or just writing in a gratitude journal. Shut off electronics and blue light at least one hour before bed. Go to sleep and wake up and the same times every day—yes, even on the weekends! While adopting a new exercise routine, working to reduce your stress and focusing on good sleep habits might seem difficult to adopt, these changes may be the hidden keys to your ultimate weight-loss success. When you focus your resolutions on lifestyle habits—rather than a number on a scale—you can impact your overall health and well-being in ways you never dreamed possible. Thank you for this information. It is definitely counterproductive sometimes to focus on weight. Great suggestions. Chelsey Amer, M.S., R.D.N. is the owner of Chelsey Amer Nutrition, an online nutrition counseling and consulting business based in New York City. 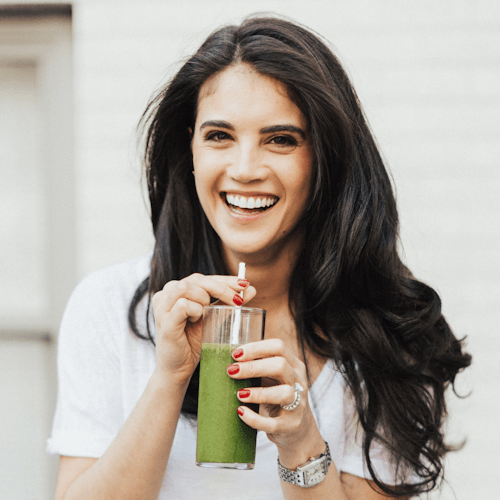 Her mission is to help women feel their best while getting in touch with their bodies and discovering how all foods can fit into their lifestyle. When Chelsey is not working with her clients, she develops tasty, food-allergy friendly recipes and photographs every bite for her healthy food blog on ChelseyAmerNutrition.com!